I have been making gourmet pizza here at the blog since I started it and I usually use a pre-made crust. I think most of the creativity in a pizza is in the sauce, toppings and flavor combinations so I let the reader make the crust on their own, which could be from scratch or store-bought pre-made stuff. 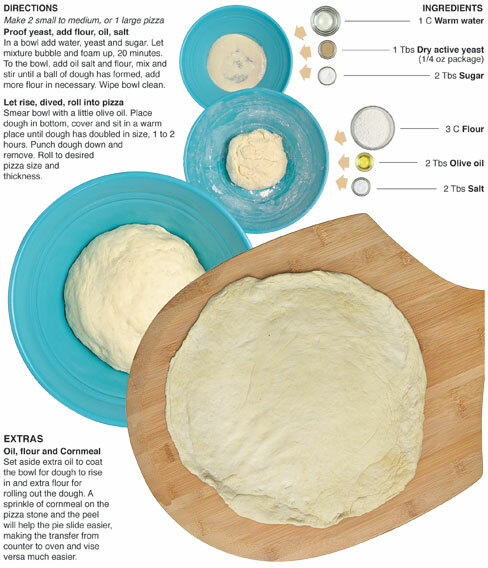 I decided it was time to give out a basic pizza dough recipe. I’ve used this for traditional pizza, grilled pizza, bread sticks, sausage rolls and a couple of other wacked out creations. It can be augmented however the cook chooses. It starts by activating yeast in warm water with sugar. Honey or brown sugar could be substituted, it’s purpose is to get the yeast going. Next the flour is mixed in with a little oil and salt. Once a ball is formed it’s left to rise and that’s it. Once it has doubled in size it’s ready to become whatever pizza magic the magician has in store. I personally like to let the dough rise twice but it’s not necessary. The extra rise and time seems to make it a little easier to work with. I made and documented this dough on Wednesday but it wasn’t until two days later that I actually made a pizza with it. I wrapped it in plastic wrap and put it in the fridge. I let it warm to room temperature, then rolled it out and made a pizza. The extra time allowed the dough to get “yeasty.” The dough seemed to have a hint of beer to it. That’s what happens when you let it rest for a couple of days. The yeast just keeps working. It made me want beer with my pizza but it was in the afternoon, and I had a bunch more to do so I just settled for the yeasty-beer aroma. In a bowl add water, yeast and sugar. Let mixture bubble and foam up, 20 minutes. 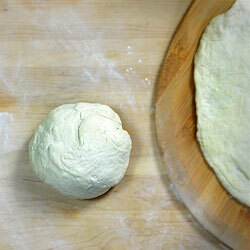 To the bowl, add oil salt and flour, mix and stir until a ball of dough has formed, add more flour in necessary. Wipe bowl clean. Smear bowl with a little olive oil. 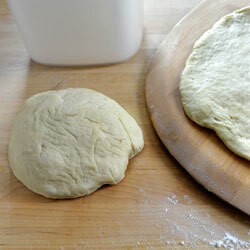 Place dough in bottom, cover and sit in a warm place until dough has doubled in size, 1 to 2 hours. Punch dough down and remove. 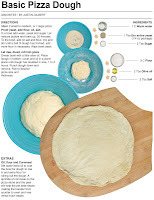 Roll to desired pizza size and thickness.